Head east from Wat Chaiwatthanaram to check out St Joseph’s Church with its large amber tower looming over the south bank of the Chao Phraya. Once the Vicariate centre of Siam, the church served as a base for French Catholic missionaries during the later Ayutthaya period. Originally made of wood and revamped with bricks, the church fell into disrepair when, in 1688, French missionaries were banished from the Kingdom after their attempt to convert the Thai king to Christianity failed spectacularly. The French were allowed back a few years later but Christianity never took off in Siam, and the church was partially destroyed in the 1767 Burmese invasion. 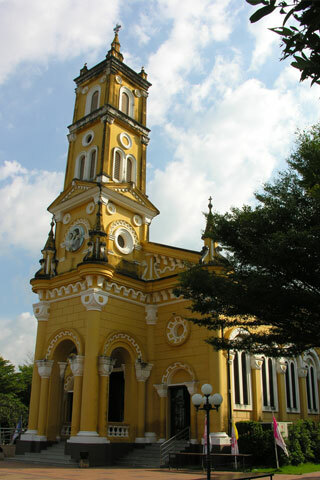 In the 1830s, a French Catholic priest rebuilt the church with the help of Vietnamese Catholics. Today it hosts a functioning congregation with regular Sunday services held in Thai. The inside is usually locked when services aren’t going on, but some lovely stained-glass windows can be seen if you get inside. Expect to navigate a sea of uniformed kids if you arrive when the neighbouring school is letting out. From Wat Chaiwatthanaram, follow the roads that run closest to the river and keep an eye out for blue signs pointing the way to St Joseph's Church.